Check out this 24 foot Centre Console Inflatable with a Diesel Inboard ! Decked out for serious fun, fishing, diving or super tender work this is a unique rig. According to the current owner this EX NAVY inflatable is an awesome rig out on the water ideal for rapid trips to Rotto for a counter meal or heading out wide for a quick fish from the mother ship. Recently refurbished by Rib Rescue in O'Connor and fitted with new sponsons at a cost of around $20,000.00 this Diesel powered RIB is ready for its next adventure. This could be a great dive boat with its custom fitted alloy swim platform, large dive style ladder and grab rails everywhere. Not having an outboard stuck right in the middle of the transom makes diving a breeze. Not a diver? Why not use it as a fishing platform, the recently fitted Lowrance HDS-9 combination Sounder / GPS and the brace of rod holders offers the serious fisho a great offshore platform. If you havent fished from a large rib you have been missing out all these years. The perfect use could be as a SUPER TENDER for the mother ship, tow this behind you to the Abrolhos Islands for a serious getaway skipping through the coral to that spot of a lifetime, with its serious forward mounted bollard towing will be a breeze. The Volvo Penta Diesel powered stern drive engine pushes out 230 Hp and neatly resides under the mid mounted console so as to not get in the way of the miles of deck space you have available. Showing just 481 hours at listing there are years of reliable life in this package. This has come to the market at the perfect time with summer just around the corner I'm expecting to see this RIB swinging off a mooring at Rotto any day. If this is something of interest to you please pick up the phone and contact R Marine Mandurah today. 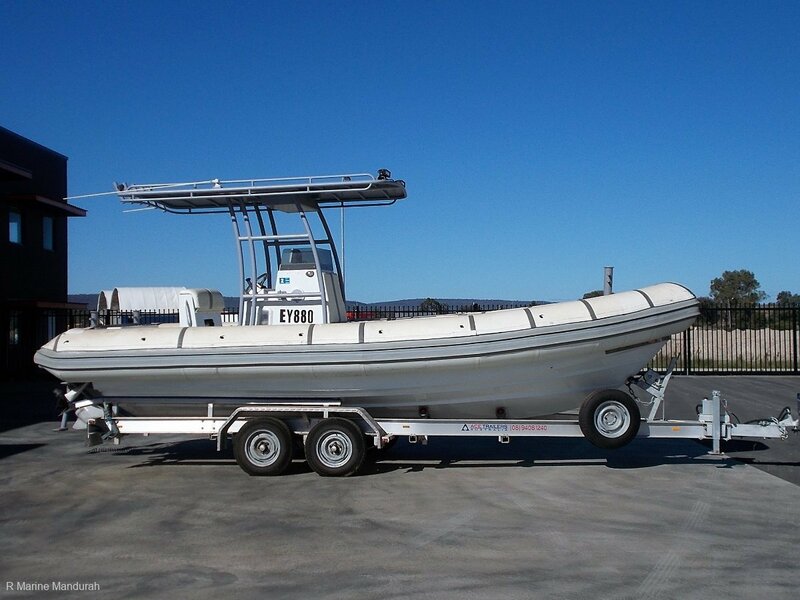 Call the office on 08 9583 5355, Paul on 0427 949 293 or Cruze on 0456 949 293, we are here to help and will be happy to arrange a suitable time to view this versatile boat. Are you considering selling a similar boat we cater to owners from Busselton to Mindarie and everywhere in between. List your boat with the most progressive brokerage company in WA, we SELL boats and offer a NO SALE NO FEE listing structure, with respectable fee charges. R Marine Mandurah, Experience the difference for yourself.